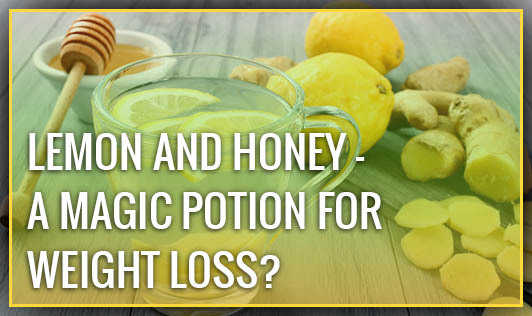 Lemon and Honey - A Magic Potion for Weight Loss? I have come across many people who religiously begin their day with a drink of warm water with lemon and honey thinking that it will aid in their weight loss. In majority of these cases, this is probably the only effort being taken by many weight-watchers to shed those extra pounds! Warm water with lemon and honey is not a magic potion! It definitely has its own health benefits, but contrary to popular belief it doesn't burn calories for you. Weight loss is all about burning calories, eating right and maintaining good health. If you are not eating healthy foods or are ending up overeating frequently, the lemon water cannot eat up all those extra calories you have consumed. Lemon gives you vitamin C, which in turn helps you to boost immunity, fight infections, fight food cravings, have supple skin, absorb calcium efficiently and much more. But don't expect this vitamin to just burn your body fat! Honey being a form of carbohydrate, is an instant source of energy and has many health benefits. It acts as an antibacterial agent, gives you a shot of energy to start your day afresh and helps to maintain the glycogen stores in your body for a long time. Exercise is the only way to burn body fat mass effectively and exercising regularly, is the only way to keep those burnt fat cells from hoarding more fat! Lots of vegetables, fruits, sufficient carbs and proteins with a dash of exercise - this will make a perfect potion for weight loss! Drinking lemon water everyday will not harm you. You could reap the health benefits of lemon and honey, but it may not help you reach your weight loss goal! It won't do any magic to that stomach paunch you've got! Get started people.... Shed those extra pounds in the right way!